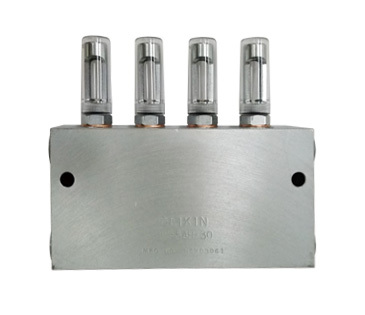 DV (Distributing Valve) | Products | Daikin Lubrication Products & Engineering Co., Ltd. The DV type distributing valve is used in dual line systems. Lubricant is reliably supplied to each of the lubrication points by the pressure of the lubricant that is alternately fed under pressure from the main supply line. Operation of the distributing valve can be checked on the operation indicator. Also, the oil amount can be adjusted as desired by the adjusting screw. Sliding sections have been finished with high accuracy to ensure that metered lubrication can be accurately performed. Application of higher pressure improves lubrication reliability and enables lubrication over a wider area. • Lubrication amount can be adjusted and operation can be inspected at each discharging port. Note) • “Loss” refers to the amount of oil required for operating the pilot piston.